Peregrine Espresso named best coffee shop in eastern U.S.
A small chain of coffee shops in the District just pulled off something big. WASHINGTON – A small chain of coffee shops in the District just pulled off something big. 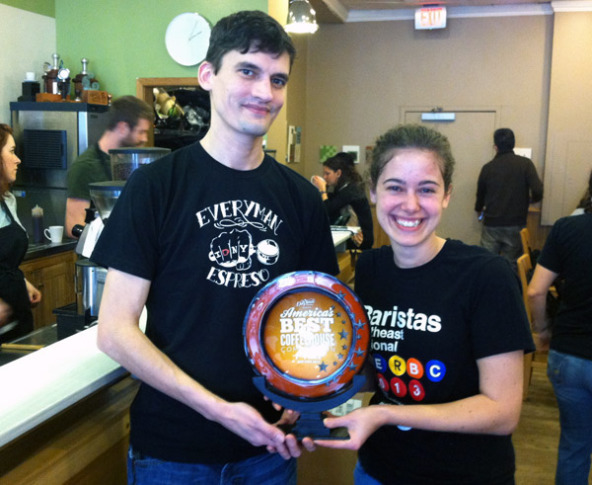 Peregrine Espresso, with three locations in D.C., has just been named the best coffeehouse in the entire eastern U.S. They also beat New Brunswick, Nova Scotia and Quebec. Originally, Peregrine applied to take part in the America’s Best Coffeehouse Competition in New York City but just missed the cut. “They had selected seven (other) teams or seven coffee shops to compete in this competition for this particular region,” says barista Jeremy Sterner. “One of the teams had to back out and we were called a week before the competition,” says Sterner. So a team of three Peregrine baristas took a shot at it. One part of the competition required them to take over a tiny coffee shop in the middle of a trade show called “Coffee Fest,” and serve coffee drinks for 30 minutes. Judges stood behind them as they worked, while other judges placed orders and tasted the results. When it was all over, Peregrine won the the top prize: A first place trophy and a $2,500 check. The victory gives Peregrine bragging rights as the best in the entire eastern U.S. and eastern part of Canada. Separate competitions will be held in Chicago and Seattle to decide the central and western region winners. Dawn Shanks is one of the baristas who helped bring home the win. Sterner says in a short time, the Washington, D.C. region has become an amazing place to enjoy great coffee. “In terms of coffee and the culture of coffee shops and high quality coffee, in the past five years it’s just exploded in D.C. You could probably name on one hand or even three fingers the amount of shops that were good 6 or 7 years ago, and since then … it’s topping 10, 15 maybe 20 or more shops in D.C. that are totally worth visiting,” says Sterner. To learn more about Peregrine Espresso and see their locations, visit their website. Follow @MBaschWTOP and @WTOP on Twitter.